Sir Henry was adopted this week! We’re so happy that one of our wonderful kitties found a forever home. If you’re thinking about adopting a cat or a kitten take a look at the ones on our web site www.t-bar.org. We have kittens and adult cats that are desperate for forever homes and February is the month to do it since we’re offering 1/2 off on adoptions right now. That’s only $35 and it covers spay / neuter and all vaccinations. Adopt, don’t shop! 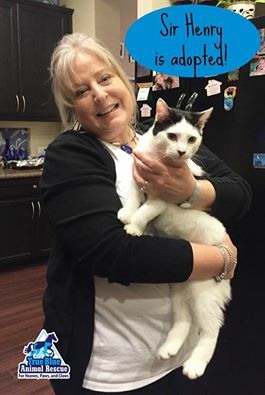 Posted in Cat Success Stories and tagged adopted, animal rescue, Cat, Success Story, TBAR, Texas, Thank You, True Blue Animal Rescue.